The story of Alella since she was built in 1962, her time sailing round the Carbery Isles and her rebuild in 2009. 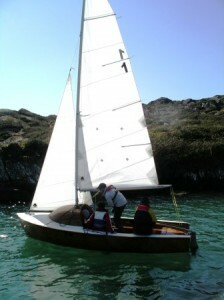 This picture shows her setting out for her first sail in April 2010 after her rebuild the previous year. Alella is a 16ft 6″ Dayboat with a cuddy based on a Fairey Falcon hot moulded hull. She has been sailed around Roaring Water bay for nearly fifty years and has provided many anecdotes some of which were once supported by real events.